As the NFL regular season draws closer, PFF takes a look at those rookies who should be very impactful on a team’s success this season. Be it a first-round pick, or later, these rookies will look to supplant their roles in helping their new team this season, and beyond. The rookie first rounder out of Alabama has already made his presence known in the preseason with some excellent plays in coverage and some bone-jarring hits. Targeted 10 times in three games, Foster has allowed seven of those passes to be caught but for a paltry 2.4 yard average while breaking up one pass. Foster has impressed with an overall preseason grade of 82.0 that has topped all rookie linebackers. In college, Foster was the top graded linebacker, excellent against the run and good in pass coverage. When targeted in coverage in 2016, Foster allowed just 6.6 yards per reception and didn’t allow a single touchdown in his career. Ranking third with 68 total defensive stops and fourth in run stops, Foster was however was the most productive LB on a per snap basis ranking first in run stop percentage at 16.3. 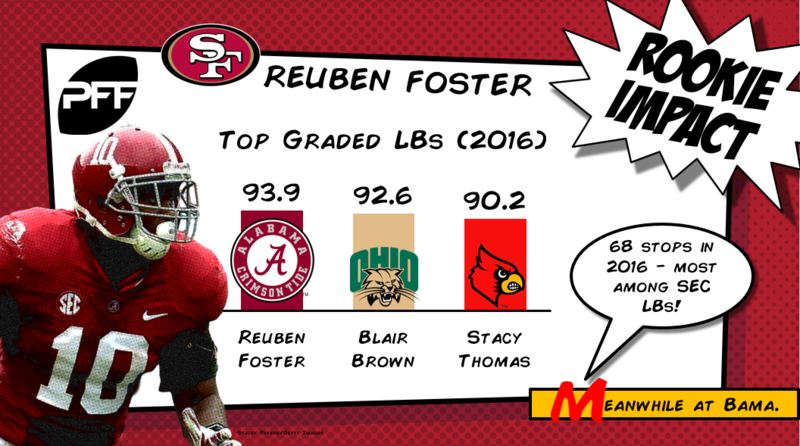 With Foster living up to his college billing in the preseason, he has everything in the making to be one of the most impactful rookies of 2017. 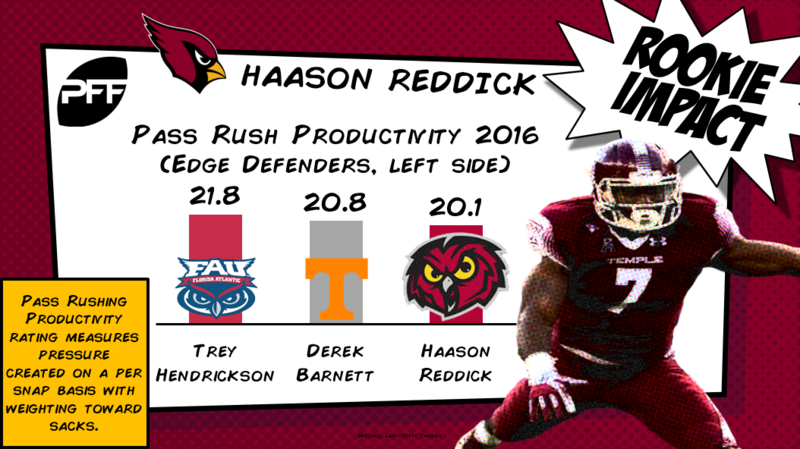 A combine superstar and late rising on many draft boards in the spring, Haason Reddick is making a position switch in his transition to the NFL. At Temple Reddick was an edge defender playing with his hand in the dirt almost 45 percent of his snaps while also standing up on the edge on just over 43 percent of the time. Add that up and it means he played off the ball on just 12 percent of his snaps, something the Cardinals will ask him to do on almost every snap as they did on 74 of his 78 snaps this preseason. Needless to say, he still has a long ways to go in that transition as evidence of his 45.6 preseason grade. That said, Reddick is an explosive and dynamic player that wreaked havoc in the AAC as he racked up 10 sacks and an additional 34 pressures in 2016. When he first made the switch to off-ball linebacker for the Senior Bowl, Reddick fared well as he made eight tackles including four defensive stops. While the NFL competition is far superior, Reddick has all the tools to make it work and the Cardinals talent on defense around him will allow the rookie to make an impact this year. A draft Twitter darling, Kupp has the production and skills to back it up. Although Kupp played in just two preseason games, he was a favorite target of QB Jared Goff’s in just his second game as he hauled in six of seven passes for 70 yards and a touchdown. In college, Kupp was one of the most prolific wide receivers in FCS history and after grading just two of his games in 2014 and 2015 combined, Eastern Washington’s 2016 season was fully covered by PFF. Kupp didn’t disappoint, as he topped all wide receivers in grade (yes an asterisk is needed as most of his games were vs FCS opponents) as he was virtually uncoverable. Kupp was a target machine as he saw at least 14 targets in six games and double-digit targets in 10. Dangerous with the ball in his hands too, Kupp forced 14 missed tackles and showed reliable hands dropping just six passes all season. At the Senior Bowl, Kupp also gave FBS cornerbacks problems in practice all week. 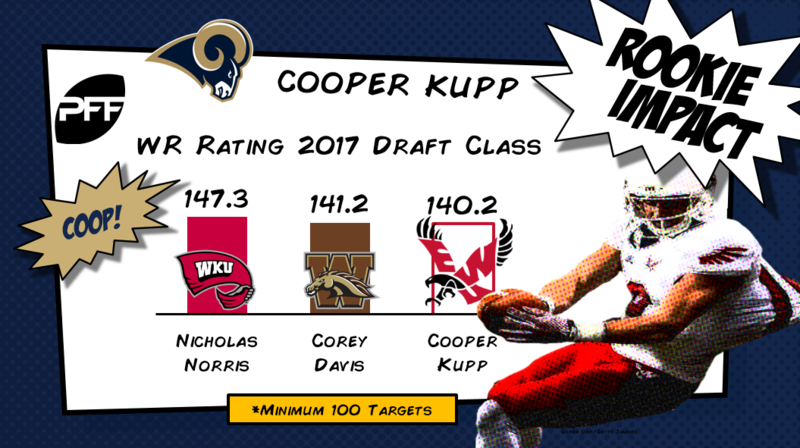 His understanding of running routes and using defensive backs leverage against them makes Kupp the Rams’ impact rookie. Pocic played center in college at LSU and was one of the best run blockers in 2016 while also grading well in pass protection as he allowed zero sacks and just one QB hit – and that was in the Senior Bowl. 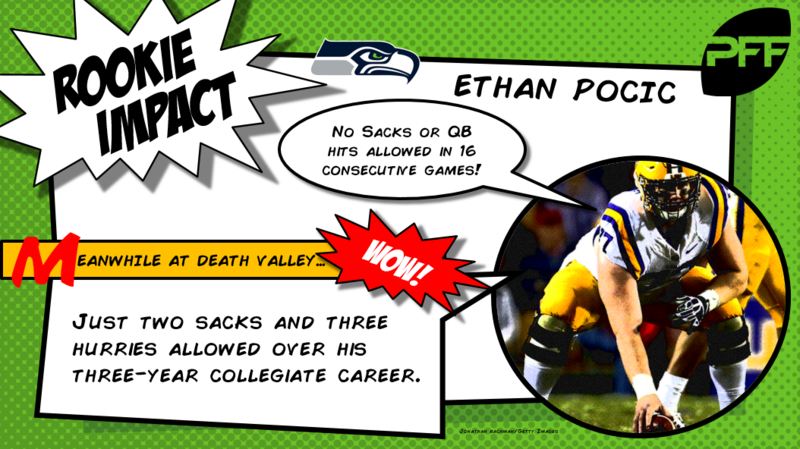 Over his career at LSU, Pocic allowed just two sacks and two QB hits while excelling as a run blocker. At six-foot-six-inches tall, Pocic is too tall to fit the mold of a prototypical NFL center and will make the switch to right tackle for 2017. So far that transition has been difficult as he has allowed a QB hit and five hurries on just 88 pass blocking snaps. What makes Pocic the Seahawks impact rookie is that the player he’s replacing on the OL graded as one of the worst tackles in the NFL in 2017. Even if Pocic struggles to adjust to a new position and NFL caliber players, his athleticism and technique will keep his play to a respectable level.